Viewers of the hit PBS series Antiques Roadshow are familiar with the dealers and auctioneers who appraise the voluminous amount of material brought to each show venue, but what do these experts collect when they are on the hunt? In a new series of articles with Antiques & Fine Art, Roadshow appraisers showcase and discuss the types of objects that make them tick. The first expert to be featured is David Rago. At the age of sixteen, David began dealing in American decorative ceramics at a flea market in his home state of New Jersey. Today, he oversees the auction house that bears his name and sells privately in the field. An author and lecturer, he is an expert appraiser for Antiques Roadshow, where he specializes in decorative ceramics and porcelain. Join us as David shares some of the favorite pieces he and his wife, Suzanne Perrault, have collected through the years. About twenty years ago, I traded a piece of Teco pottery with Annie Liebowitz, who wanted it as a gift for a friend. I received six of her photographs in return (she was very generous and gracious). 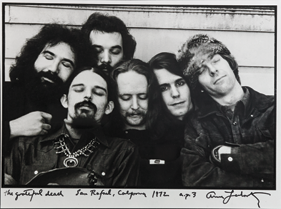 One image I wanted, however, was an early photo she had taken of the Grateful Dead. The edition was very limited and Annie found one for me. Its value today is probably in the $3,000–$4,000 range. This repurposed piece has become the de facto logo for America Antiques and Design in Lambertville, New Jersey. We acquired the clock from our close friend David Teague (I was best man at his wedding a few years back). It was the first thing I wanted to buy when we moved into our home in 2005. 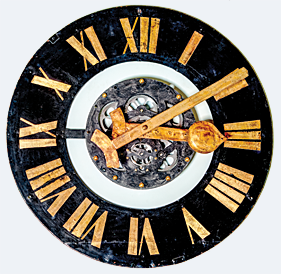 Teague has made a business of repurposing everything from nineteenth-century steel loom bases to carnival props, but his clocks resonated more than anything else. I mean, who can’t use one? Ours was originally for a nineteenth-century European bell tower. The clocks are usually for decoration only, but as a birthday gift, Suzanne had a motor (made by another local artist Ed Roland) attached. It’s arguably the centerpiece of the house and I look at it at least twice a day. Its value, including the motor, is about $7,500. Like many of our closest artist friends, Tom Levine was a customer first (buying George Ohr pottery), and then we started hanging out. In the last five years we’ve probably bought as much from Tom as he has from us. Generous to a fault, Tom gave us a few of his pieces and, after living with them, we realized we wanted more. 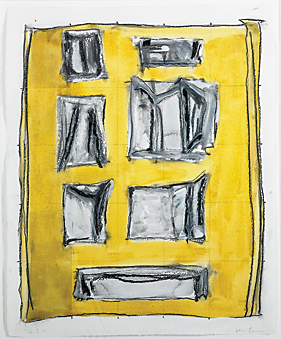 This painting was bought from Washburn Gallery in New York, who represents Tom. Its current value is probably $10,000. Clare Graham is mostly recognized for his work as a designer for high-end theme parks and visual extravaganzas. Super Bowl halftime shows (one included Michael Jackson) are his bailiwick. As a hobby, Clare gathers things that are inexpensive, abundant, and have merit, to his curious eye. For the Jesus screen (one of a series of five or six similar pieces, including Blue Boy and Pinkie), Clare procured, over many years, thousands of paint by number paintings, completed by nameless, amateur artists; he bought them mostly at flea markets in southern California. 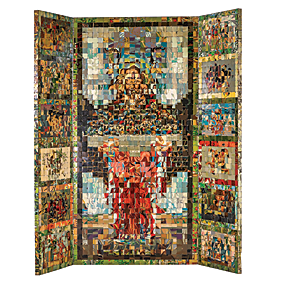 After selecting the hundreds needed for this one screen, he cut them into squares and reassembled the pieces into an analytical cubist format, with Christ as the central image. When I first saw the series of screens, at the Los Angeles Modernism show, I was simply blown away. Clare is a craftsman of the highest order, creating cool new images by repurposing material from a lower to a higher art form. This screen remains among my favorite pieces. Its value is probably in the $10,000 range. We’ve been buying Bob Beck’s work for over twenty years. Pennsylvania Academy trained, Bob made a name for himself by capturing local scenes and events, continuing in the tradition of the artist colony where we live. He is always the first to donate artwork to local worthy causes, such as the FACT fundraisers we’ve held at our action hall (FACT raises money for AIDS patients who have run out of financial options). 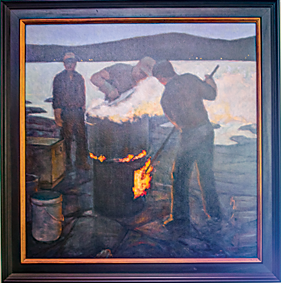 Our tastes began to run less toward representational art as our business moved into modern design and postwar contemporary art, and Bob is more of a traditional genre painter. But this one, Lobsterman, was so murky and brooding, it seemed more like a nineteenth-century Symbolist painting. We fell in love with it and bought it on the spot. Its current value is probably around $15,000. Ed Murphy, one of our closest friends, is a locally based cabinetmaker. He did our kitchen cabinets in zebra wood. They are not just beautiful, but also intelligently made. For his wall sculptures, he repurposes wood bits from his studio as well as incorporating found objects. This one was a prize winner at the most recent New Hope sculpture show, and we thought it would fit perfectly with the small collection we’d been building over the past few years. We bought it for $2,500. Antiques Roadshow is debuting two new specials in November and December. Survivors premiers Monday, November 18th at 8pm and Finders Keepers premiers Monday, December 23rd at 8pm ET (check local listings). Visit pbs.org/antiques to find out more about January’s season 18 premiere.